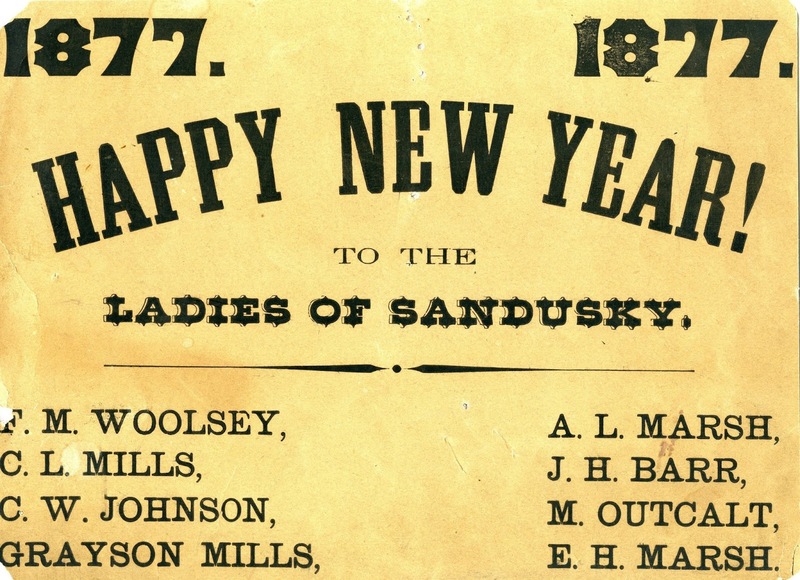 "Happy New Year to the Ladies of Sandusky"
In 1877 eight gentlemen from Sandusky wished the “Ladies of Sandusky” a Happy New Year. 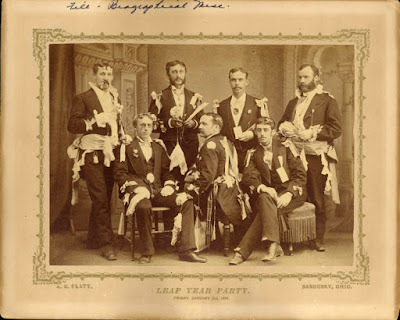 Possibly this was in conjunction with a party or dance that was held to celebrate the New Year. We do not know details about all the men, but some of the surnames included in the group come from families that were prominent in the early years of Sandusky’s history. 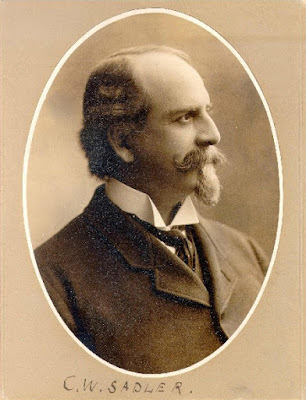 In the 1870s Fred M. Woolsey worked with his father, J.V. Woolsey in a factory that made wagon and carriage wheels. Charles L. Mills and Grayson Mills were both grandsons of Isaac Mills, who was one of the co-founders of the city of Sandusky. Fred Woolsey and C.L. Mills are two of the men in the picture below (at a "leap year party" the previous January); unfortunately we do not know which ones they were. Edward H. Marsh was involved in the plaster business in this area. 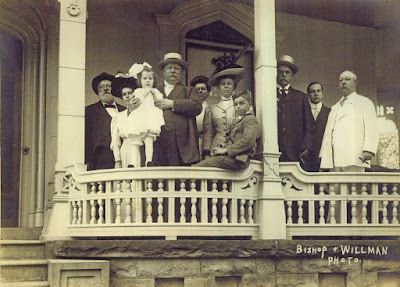 He was a personal friend of President William Howard Taft. You can see Edward H. Marsh in a white jacket in the picture below, when future President Taft was campaigning in Sandusky in 1908. 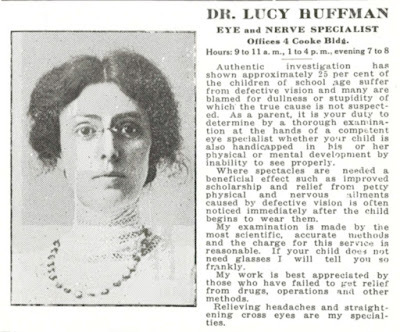 Dr. Lucy Hoffman (sometimes spelled Huffman) placed an advertisement in the December 1914 issue of the FRAM, the yearbook of Sandusky High School. Dr. Hoffman was an eye and nerve specialist with her office in the Cooke Building in Sandusky. 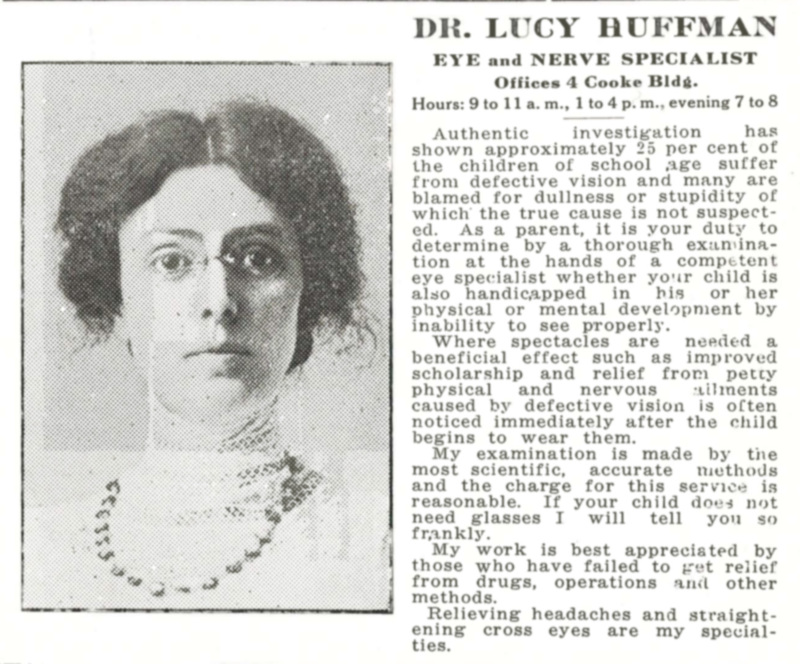 The FRAM advertisement stated that Dr. Hoffman’s specialties were relieving headaches and straightening crossed eyes. She claimed to use “scientific, accurate methods” in her eye examinations, and her fees were reasonable. 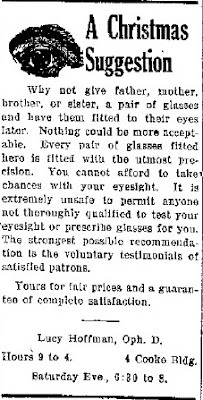 In the 1916 advertisement below, Dr. Hoffman says emphatically that drugs and drops should not be used in an eye examination. Her method was a fogging system, which did not call for dilation of the pupils. Dr. Hoffman was only in Sandusky briefly. 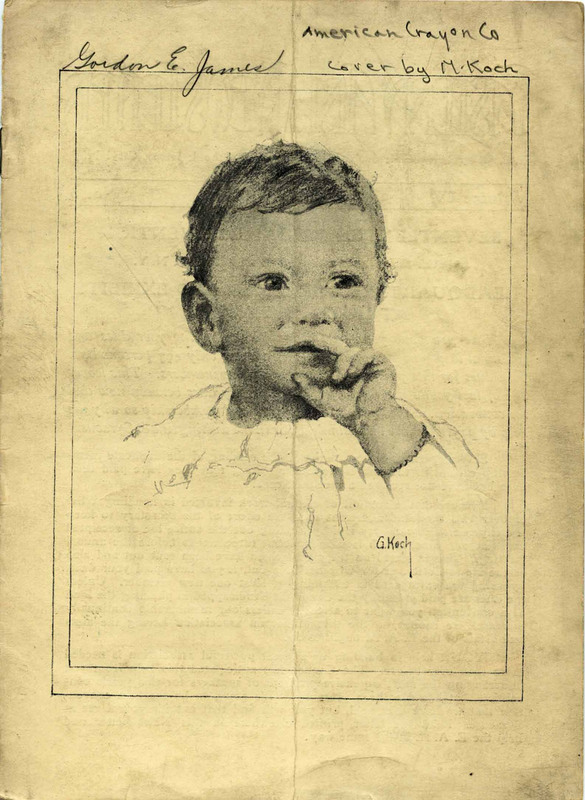 According to an article in the July 11, 1919 issue of the Sandusky Register, she moved to Jefferson, Ohio during the summer of 1919. Did you get glasses for Christmas? Several Christmas cards sent by Miss Mildred Piestschman to the Knisely family are now in the collections of the Sandusky Library Archives Research Center. In 1951, Miss Pietschman created the holiday card pictured above, which depicted singers arranged on a mobile. 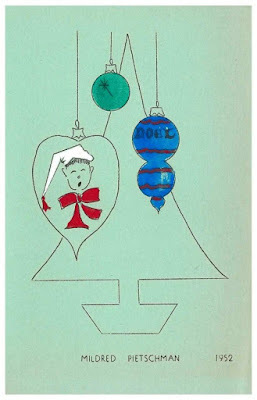 The next year, she sent a card that featured ornaments on a tree. The cards were created on one piece of paper, which was folded in fourths, to create its own envelope. So Mildred was not only artistic, but she was thrifty! 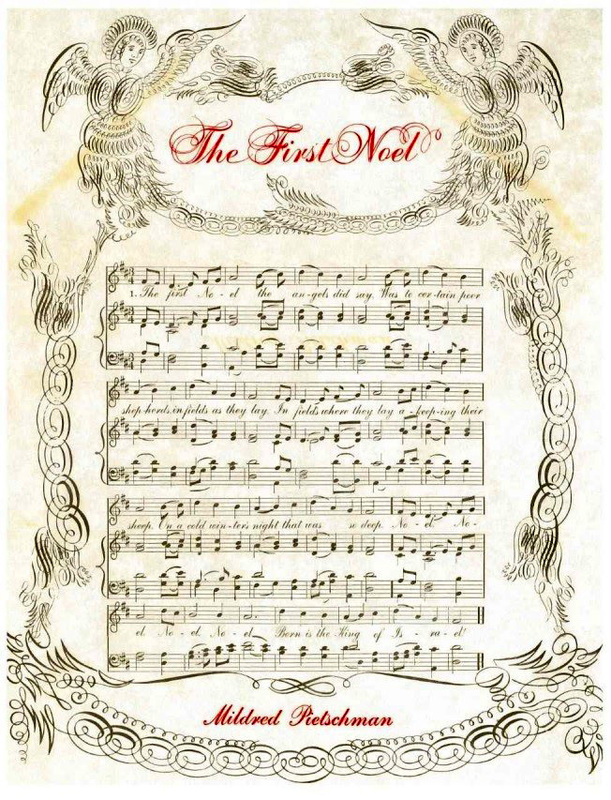 In 1956, she sent a full page greeting that contained the first verse of the Christmas carol The First Noel. 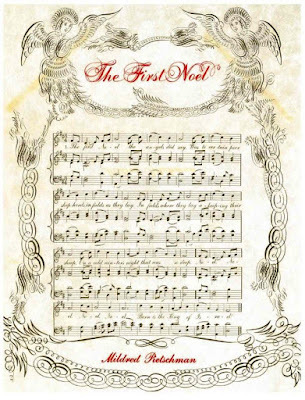 Angels and decorative flourishes adorned the piece of sheet music. Mildred Pietschman was an elementary music teacher in the Sandusky City Schools for 45 years. Eventually she served as music supervisor. In 1959, she married attorney John F. McCrystal. Mrs. Mildred Pietschman McCrystal died in a tragic automobile accident while she was on vacation in Mexico on October 19, 1990. The Mildred Pietschman McCrystal Scholarship is awarded annually to Erie County students, with preference given to music majors. Local newspaper articles provide us with interesting details about how Christmas was celebrated at each hospital in 1923. Early on Christmas morning, Betty Mound sang “Softly the Babe was Sleeping” in the room where all the newborn babies were sleeping at Good Samaritan Hospital. 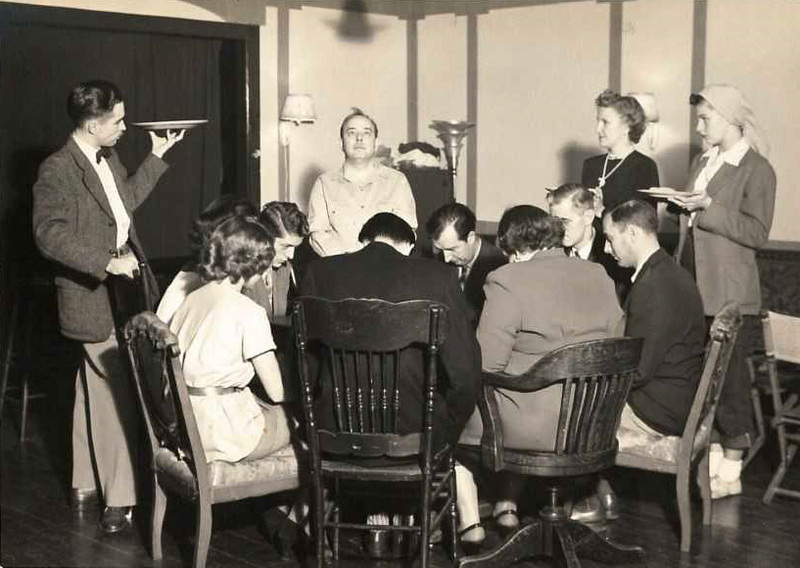 All the nurses attended an early morning service, at which Lillian Gowdy read the Christmas story. C. Webb Sadler, a trustee of Good Samaritan Hospital, gave all the nurses a long-stemmed red rose, which they carried as they sang Christmas carols throughout the hospital. A Christmas tree was placed in the children’s ward, and gifts were distributed to all the youngsters. Even a young boy named Jack, who had been critically ill, was feeling well enough to enjoy the festivities. 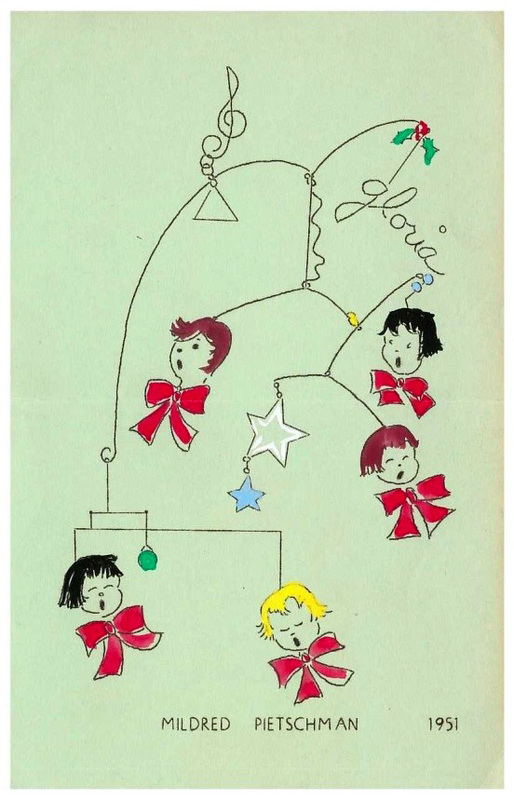 At Providence Hospital, four youngsters were treated to presents, candy and oranges and “all the delicacies that the nurses felt were for their good.” Holiday music was played on Ed Strang’s radio. Visiting hours at both hospitals were extended, so that patients and their families could enjoy Christmas Day together. 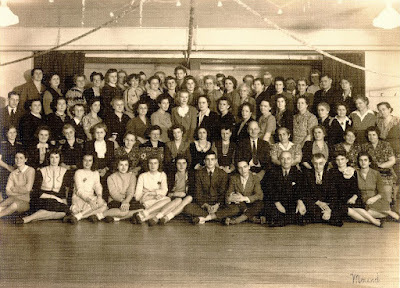 In the historical photograph collection of the Sandusky Library Archives Research Center, is this picture of the staff of Good Samaritan Hospital at a holiday party in December, 1923. 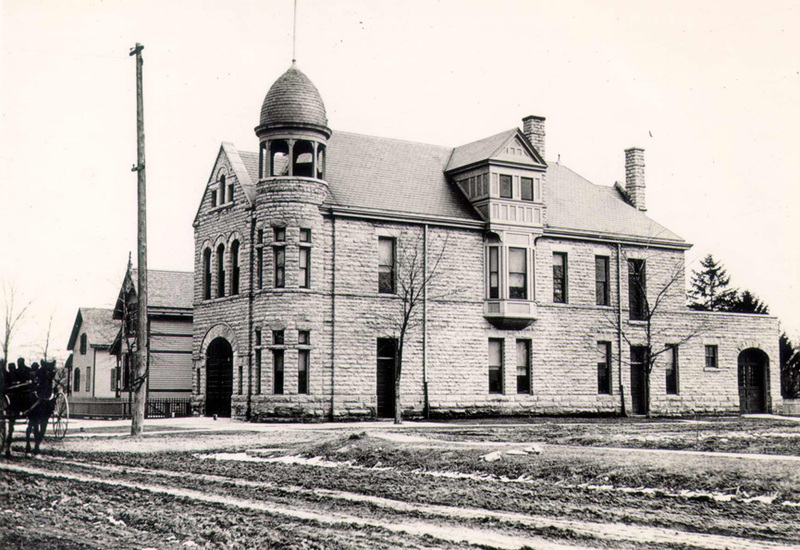 If you would like to read more about what was happening in Sandusky in years past, visit the Sandusky Library Archives Research Center, where local newspapers dating back to 1822 are found on microfilm. This historic Ohio notary seal is now in the collections of the Follett House Museum. 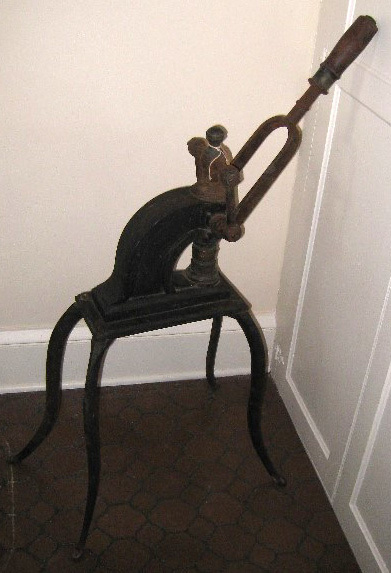 It is much larger than the notary seals in use today. A Notary Public is a person authorized to witness the signing of important documents. Many banks, legal offices, and government offices have staff on hand who are recognized as notary publics (or notaries public -- both are acceptable according to Merriam-Webster) by the state of Ohio. Wills, deeds, and other legal transactions often need to be notarized. 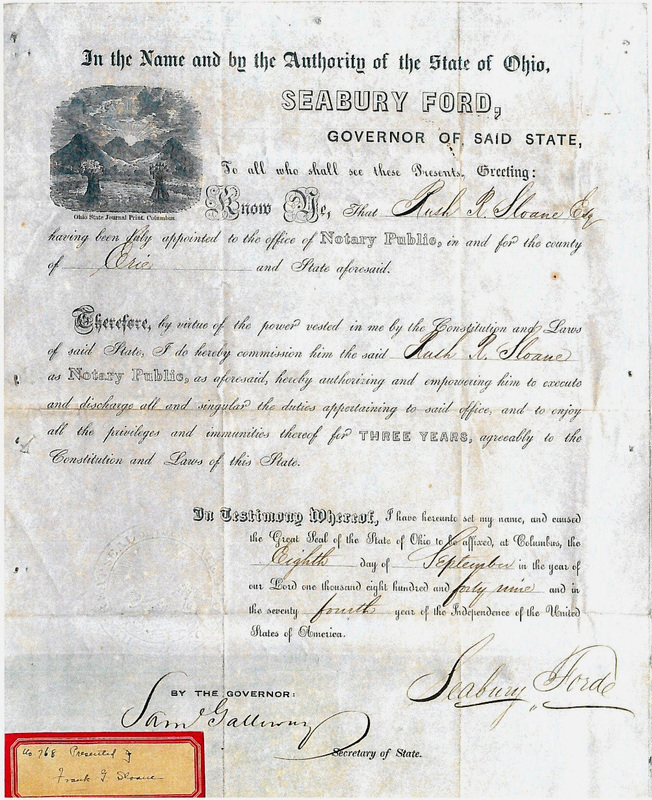 Several certificates of the commissions of notary publics that were issued to Hewson L. Peeke and Rush R. Sloane are found in the files of the Sandusky Library Archives Research Center. 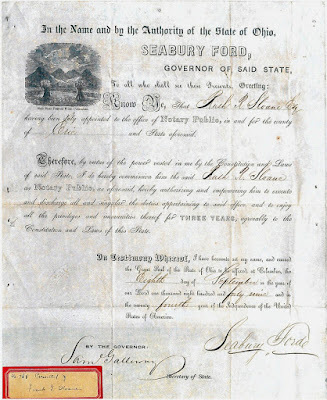 Below is a document that indicates that Rush R. Sloane was appointed as Notary Public by Governor Seabury Ford, on September 8, 1849. 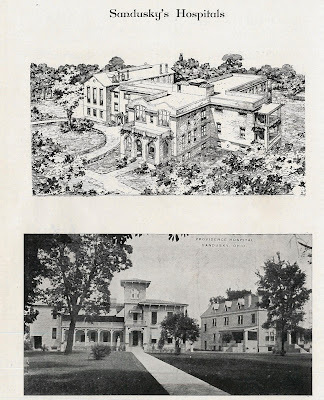 Rush R. Sloane was Mayor of Sandusky (1879-80), owned the former Sloane House Hotel, and was very active in the Underground Railroad activities of the Firelands. Two centuries ago, Sandusky’s founders assumed that Sandusky’s protected harbor destined the city to become the leading port on Lake Erie. Unfortunately, this was not to be the case. The problem was simply that the entrance to the bay was blocked by shifting sand bars, and the bay itself was shallow and difficult to dredge because of the underlying limestone. 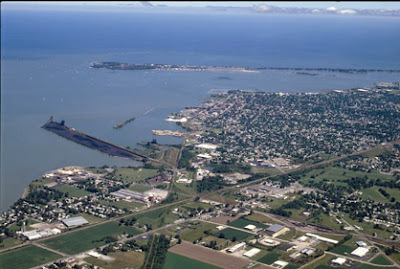 The original channel into the bay followed the convoluted course of the Sandusky River bed in the direction of Johnson’s Island and then turned south to the city’s waterfront. The channel and the waterfront docks were shallow and poorly marked. Ships often ran aground or hit submerged rocks, and Sandusky soon earned a reputation as a port to be avoided. Cleveland, Lorain and Toledo thrived. Sandusky languished. Recognizing the situation, improvements were continually made during the course of the 19th and early 20th Centuries. In 1889, the “Straight” channel 17 ft. deep was dug from the foot of Warren St. to the tip of Cedar Point and the channel was marked, but the “Dock Channel” along the waterfront remained unmarked and quite shallow. In 1895, construction was begun on a Jetty at the tip of Cedar Point in an ongoing effort to prevent sand from blocking the entrance to the bay. 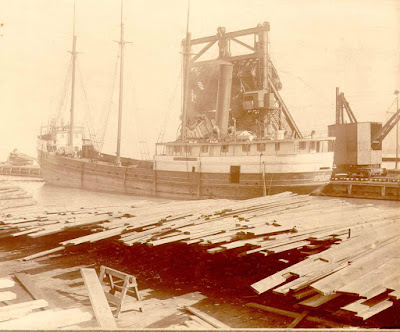 Iron ore, lumber, coal, and grain were shipped in large quantities from the B & O docks at the foot of Warren St. but as ships got bigger and bigger, these improvements proved to be too little and too late. The mouths of the Maumee, Black and Cuyahoga Rivers were easy to dredge. Sandusky Bay was not. Sandusky prospered, but it was unable to attract heavy industries such as steel manufacturing that depended on deep water ports. One by one companies began to close their shipping operations in Sandusky in the early years of the 20th Century with one notable exception – the Coal Docks. 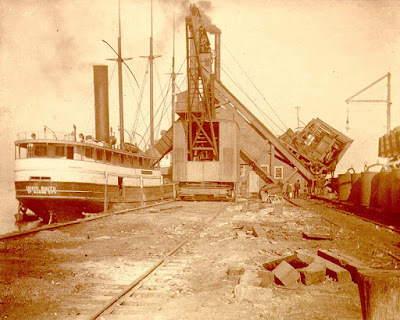 In 1891, the Sandusky & Columbus Short Line Railroad Company opened a straight track from Sandusky to Columbus and constructed the original Coal Dock later known as Pier #1 at the foot of King St. The City of Sandusky helped fund construction of the pier and the cost of dredging to allow lake freighters access to the pier. 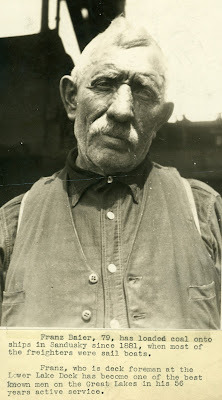 The small freighters of the day were initially loaded by hand using wheelbarrows, but in 1893, Pier #1 was equipped with a steam driven loading apparatus known as the “Whirly.” Workmen loaded coal in buckets that were then whirled over the side of the freighter where they were dumped and then whirled back in a continuous circle. In 1898, the “Whirly” was replaced by a new ship loader that could lift a coal car to a level above a ship’s deck from where its contents could be dumped into the cargo hold. It could unload fifteen coal cars per hour which meant that a four and a half ton cargo could be loaded in just under six hours. 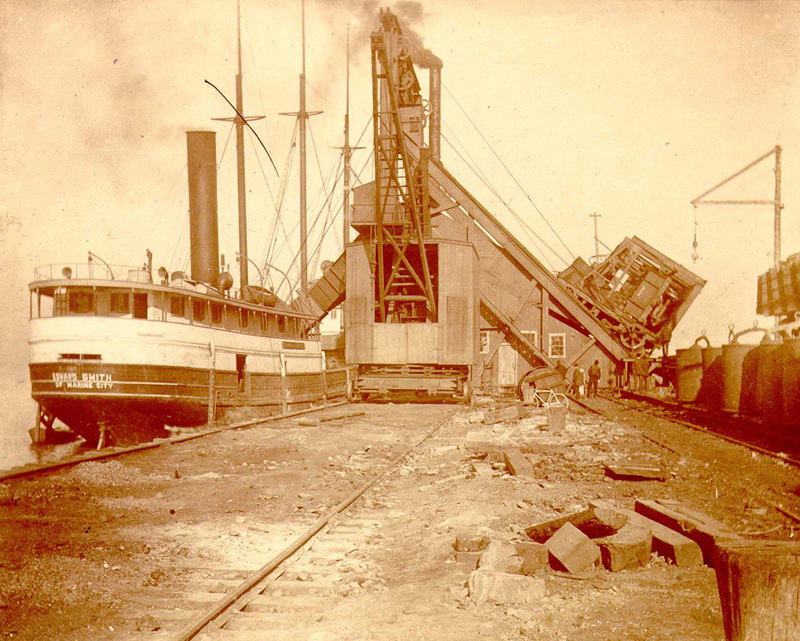 In 1902, the Sandusky & Columbus Short Line Railroad was purchased by the Pennsylvania Railroad and the coal dumper on Pier #1 was replaced with one that could handle up to 25 cars per hour. Coal demand was high, and in 1914, a second dumper was installed on Pier #2 located just to the west of Pier #1. The coal shipped from the docks was originally destined primarily for power production, but the docks were beginning to supply more and more coal for steel production. 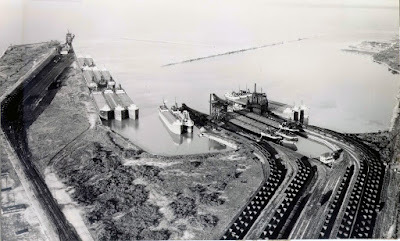 In 1937, with Piers #1 and #2 operating around the clock and larger and larger freighters being constructed, the Pennsylvania Railroad announced a mammoth project that was destined to transform the Sandusky harbor and finally resolve the issues associated with the harbor’s channels. A new Pier, designated #3, was to be constructed west of Pier #2 that would be almost a mile long and 600 ft. wide. A new dock channel with a wider turning basin, and a “Bay Channel” that would permit ships to return to the lake to the north of the “Dock Channel” were part of the project. Eleven million tons of steel sheeting and pilings and the 2.5 million cubic yards of silt and debris that were dredged from the bay were used in the construction of the pier. The crowning achievement was the construction of a giant new Coal Dumper which Sanduskians have enjoyed watching operate to this day as it lifts coal cars high in the air and dumps their contents into the holds of today’s huge lake freighters. The new dumper stands 172’ above water level and could dump 30-35 50 ton rail cars per hour. In 1944 when the demand for coal peaked, a record 14.3 million tons of coal were shipped from Piers #1, #2 and #3. People enjoy watching freighters enter and leave the bay and sometimes wonder why we don’t see as many freighters these days. The answer is simple. In 1955 Sandusky loaded 1123 lake freighters with 8.1 million tons of coal. It would only take 270 of today’s much larger freighters to haul the same amount. Piers #1 and #2 could not accommodate the larger freighters which resulted in Pier #2 being closed in 1957, and Pier #1 being closed in 1969. When the docks were sold to the Norfolk and Western Railway Company in 1964, plans were soon underway to add a coal stockpiling and reclaiming facility to Pier #3. It was designed to provide space for one million tons of stockpiled coal and incorporated nearly 2.56 miles of interconnected conveyer belts. Three silos were installed 40 ft. in diameter and 194 ft. tall each with a capacity of 3,500 tons. Two large pieces of equipment were constructed to move stockpiled coal of different grades to the silos or directly to a waiting freighter. The “Bucket Reclaimer” which stands 45 ft. tall and weighs over 320 tons can move 3,000 tons of coal per hour. The “Bandwagon” which stands over 90 ft. tall and weighs 310 tons can stack coal into storage piles and work in conjunction with the “Reclaimer” to transport coal from storage piles directly to vessels. 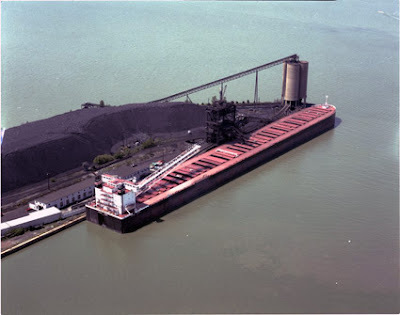 These two pieces of equipment increased vessel loading capacity from 3000 to 7,000 tons per hour and on September 3, 1988, Pier #3 loaded a 989’ long freighter with 59,058 tons of coal, a record for the Great Lakes. Now owned and serviced by Norfolk Southern and operated by Sandusky Dock Corporation, the Pier #3 coal dumper has been in operation for 79 years. Remarkably, it is able to efficiently handle today’s 100 ton rail cars that are 50 tons heavier than those of the 1930’s. Today 95% of the coal shipped from Sandusky is used in the manufacture of steel. Sandusky, like most cities in along the Great Lakes has lost much of its industry during the past forty years, but the Sandusky Dock Corporation continues to evolve and prosper utilizing ever more advanced equipment and technology. Orders for different grades of coal can be filled promptly and efficiently thanks in large part to the foresight of the men who designed Pier #3 many years ago. The Sandusky Docks are a tremendous asset for our community. The Pier #3 coal dumper ranks with the Top Thrill Dragster as one of Sandusky’s premier attractions. Sandusky would not be the same without it. The popular eatery Joe Sundae’s has been in operation at the northeast corner of Shelby and West Washington Streets since 2007, but this commercial property has been home to several other businesses since the 1850s. Ellie Damm wrote in her book Treasure by the Bay that Henry Lotz had this building constructed between 1850 and 1852, along the edge of the Old Plat of the city of Sandusky, and ran a grocery store at this location for over thirty years. Below is a portion of page 61 from Hellrigle’s 1876 Sandusky City Directory. This listing states that Henry Lotz resided at the same address as his grocery store. After Lotz died in 1887, a variety of different businesses were located in this historic brick structure. It was briefly a millinery shop. 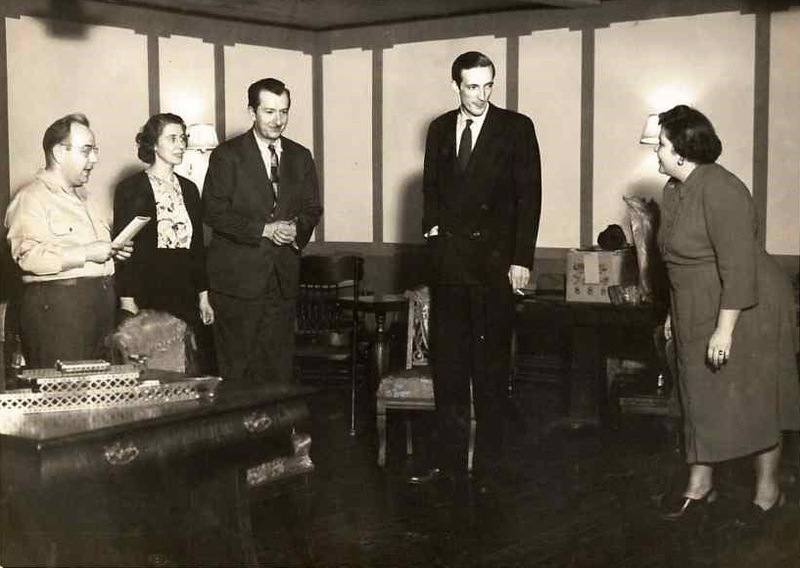 For a time, Mr. Lotz's granddaughter Myrtle L. Meagher had her piano studio on the upper floor. 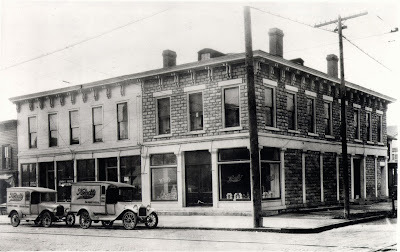 In the early 1920s the Maschari Brothers had their fruit store here, before moving to the current location. 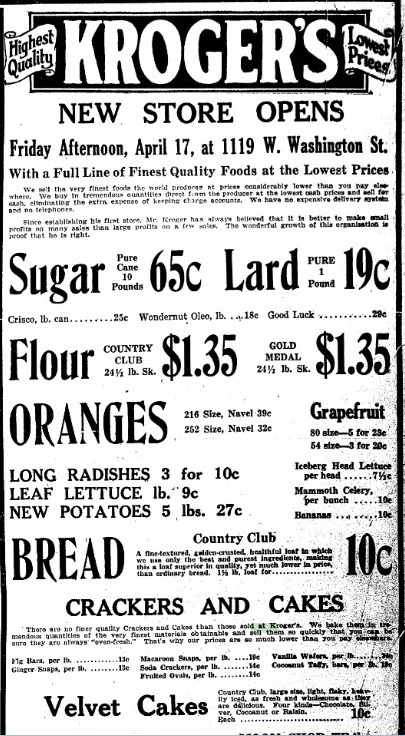 On Friday, April 17, 1925, a Kroger’s store opened at 1119 West Washington Street. 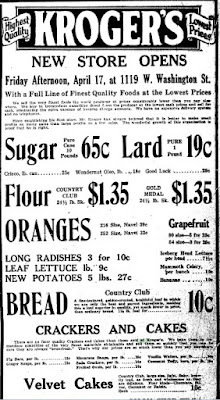 Bread sold for ten cents a loaf, and flour was $1.35 for twenty four and a half pounds. From 1945 until about 2005 Cronin’s Tavern was at this location. 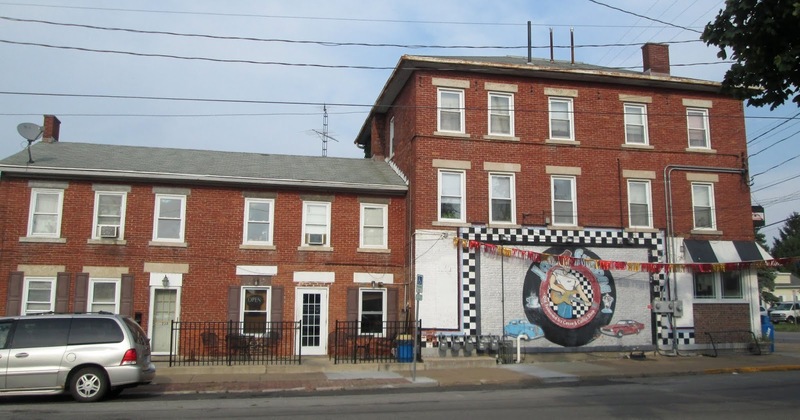 Dan Cronin had a tavern on West Market Street before moving to this location. Later the proprietor of Cronin’s was Bee Bumgardner. In 1964 Cronin’s customers were entertained by Adrian “Foxey” Fox on drums and Phyllis Kromer at the piano and organ. During the 1960s a large advertisement for P.O.C. 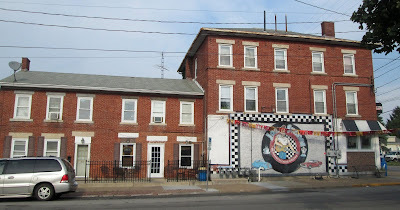 pilsener beer was painted on the Shelby Street side of Cronin’s Tavern. You can see a picture of Cronin’s Tavern on page 72 of Ellie Damm’s book Treasure by the Bay. The building at Shelby and West Washington has seen thousands of local residents pass through its doors through its many years of existence in our community. 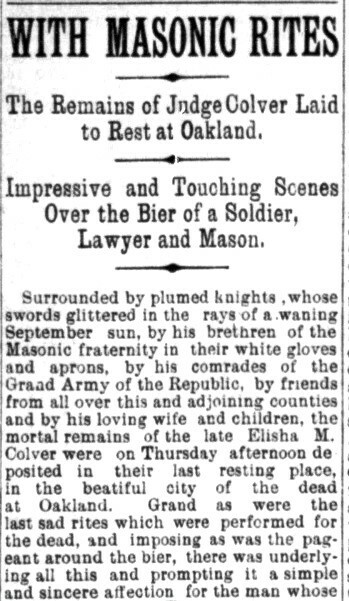 In Judge Colver’s obituary in the Sandusky Register of September 25, 1895, the headline read “Death of a Patriot, Soldier, Jurist and Orator.” Elisha M. Colver was born in Hudson, New York in 1832, but received his early education in Monroeville, Ohio. He graduated from the Cincinnati Law School in 1859, with the highest honors of his class. After leaving college, he moved to Perrysburg, Ohio. While in Perrysburg, he enlisted in the Third Ohio Cavalry, first serving as first lieutenant of Company B; later he was promoted to Captain. In 1864, Elisha M. Colver came to Sandusky, Ohio to aid in the recruiting of a cavalry regiment. Having concluded his military service, he opened up a law office in Sandusky. He was elected as Sandusky’s City Solicitor in 1868, and served as Probate Judge of Erie County from 1869 through 1878. Judge Colver's first wife was Clara Prout. After her death, he married Miss Caroline T. Wood. 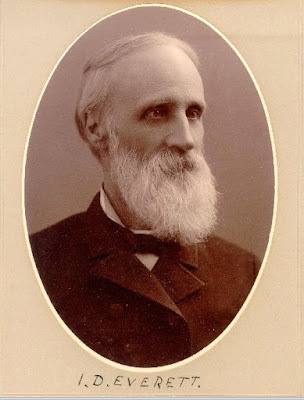 Judge Colver was a charter member of the McMeens Post of the Grand Army of the Republic, and was very active in local Masonic organizations as well. He was known to be an excellent speaker, with his speaking services in great demand, and “his energy would put to shame many a younger man. He was in every sense of the word an American citizen and his enthusiasm in the support of American institutions was unbounded.” Judge Colver had delivered the eulogy for John Brown, Jr. at Put in Bay, just a few months before his own death. Judge Colver was buried in Oakland Cemetery in the family plot. 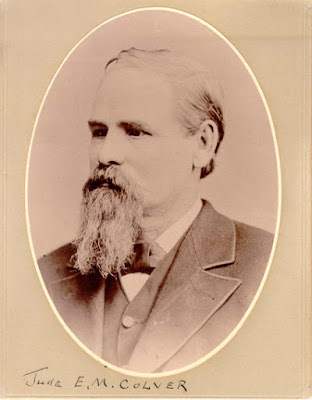 To learn more about Judge Elisha M. Colver, see Elected to Serve, by Patty Pascoe at the Archives Research Center of the Sandusky Library. Also, a lengthy tribute to Judge Colver appeared in the September 27, 1895 issue of the Sandusky Register. 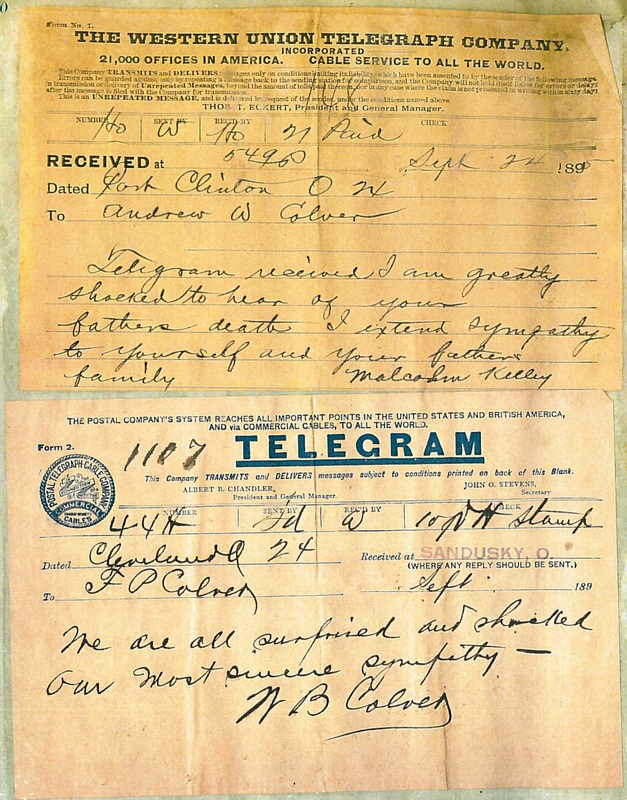 The Sandusky Library Archives Research Center has in its collections a scrapbook containing letters and telegrams of condolence sent to the family of Judge Colver following his death. 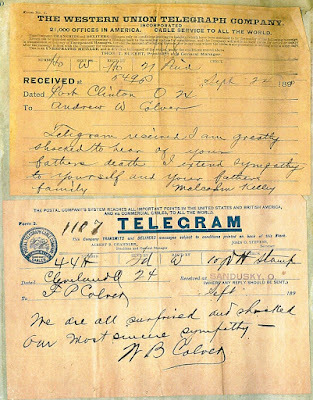 The telegram below was sent by Judge Malcolm Kelley. Above is a painting by George Koch, which is on display in the Children’s Services area of the Sandusky Library. 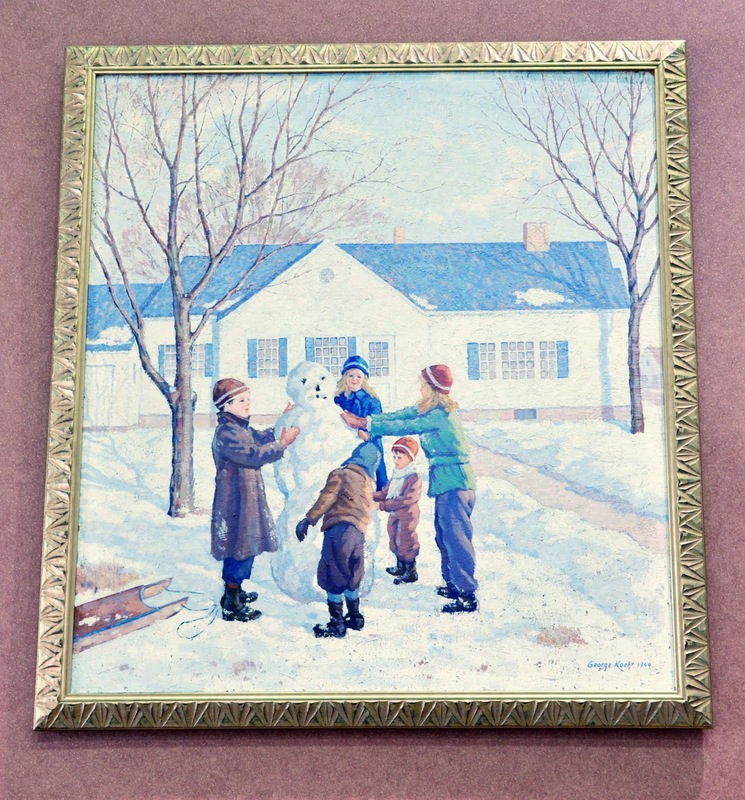 It depicts children building a snowman in the 1940s. George W.A. Koch died on March 2, 1947. 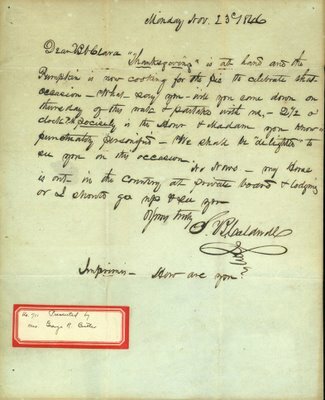 He was survived by his wife Maude, a sister, niece and nephew. Below are illustrations he made for promotional materials for the American Crayon Company. When M.J. Bender opened a grocery store at the southwest corner of Monroe and Hancock Streets in Sandusky on February 18, 1891, a newspaper ad stated that it was “one of the finest and largest grocery stores in Sandusky.” Bender’s carried a full line of fancy and staple groceries, flour, and feed. The store was located on the site of Ohly’s old stand. By 1908 Mr. Bender moved his store to the corner of Hancock and Water Streets. For a brief time, sometime between 1910 and 1920, Wendt’s grocery was at that location. In the 1920s and 1930s, the Lazarra and Maschari families ran a fruit market on this site. 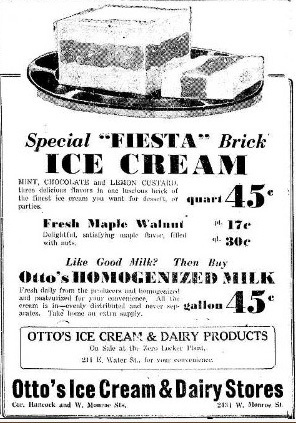 From at least 1940 through 1960, Otto’s Ice Cream was in business at 701 Hancock Street. This advertisement appeared in the Sandusky Register Star News on January 25, 1946. By 1990 a flooring business was in operation at 701 Hancock Street. Many different businesses have been in operation at this busy Sandusky intersection. Some years, no business was at this location. 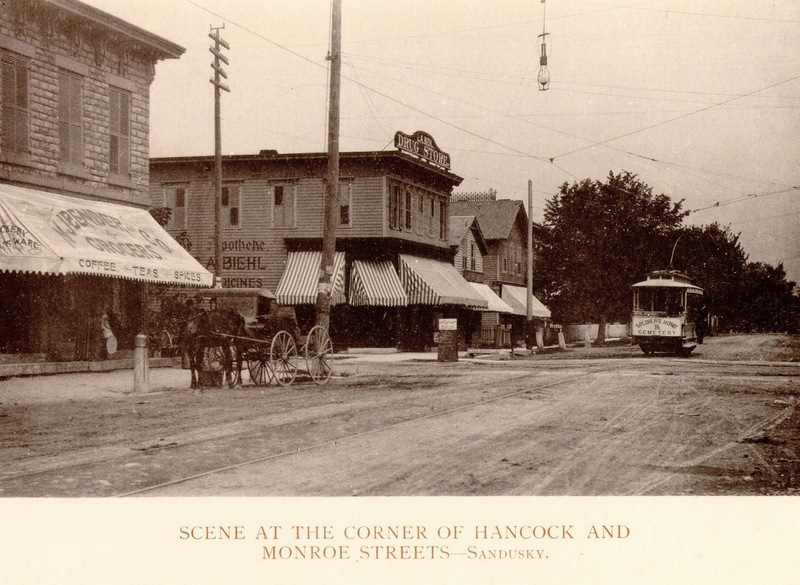 To learn more about any specific location in Sandusky, visit the Sandusky Library to view historic Sandusky city directories. The street listings are helpful in determining what businesses were at what address at a given time. 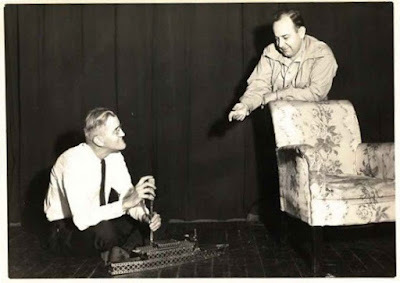 On November 15 and 16, 1948, the local dramatic group the Harlequins presented the play You Can’t Take it With You. The play was a comedy written by George S. Kaufman and Moss Hart. Some of the individuals in the picture above are: Carl Miller, Fran Miller, Eldon Rosswurm, Carroll Post, Lois Meyer, Shirley Carpenter, June Palmer, Ralph Hoffhines, Dorothy Lalond and Jack Mayer. The play was about the fun-loving Sycamore family. In the local production featured June Palmer as Alice Sycamore and Ralph Hoffhines as Tony Kirby. Below is another scene from the play. Carroll Post and Orson Kniseley built a model boat for the play. An article in the November 16, 1948 issue of the Sandusky Register Star News reported that “good performances were given by all.” Jack Mayer stole the show as a Russian ballet master, sporting an eagle tattoo and a Russian accent. Someone in the cast created a holiday greeting card with a picture of the set from the play. These photographs were donated to the Sandusky Library Archives Research Center from the Kniseley family. 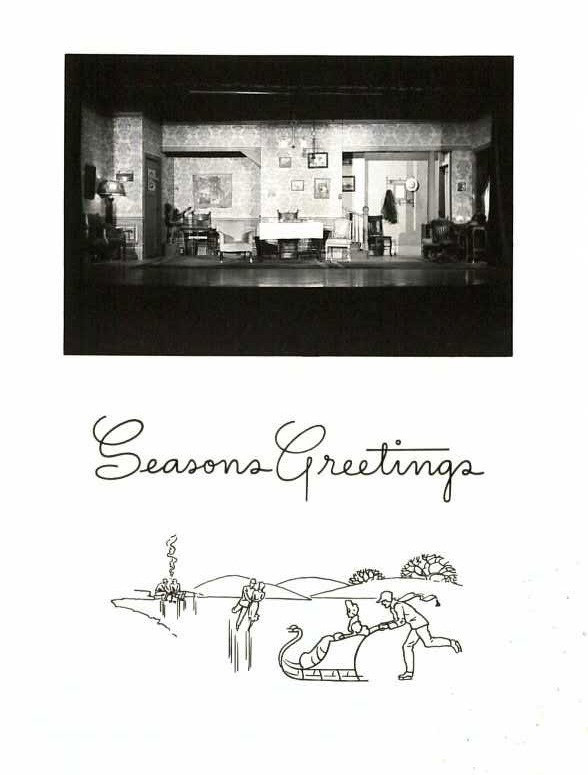 Orson Kniseley played Grandpa Vanderhoff in the local play. Isaac D. Everett was born in 1830 to Adam and Mary (Wolverton) Everett. In 1862, he married Lavinia Nettleton, who was fondly known as Fanny. 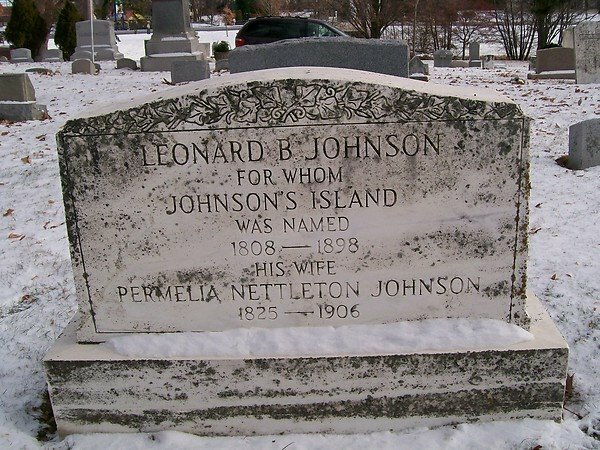 He was the brother in law of Leonard B. Johnson, the owner of Johnson’s Island at the time. In the 1867 Sandusky City Directory, Mr. Everett was in a partnership with Andrew Zerbe and E. and F. Nicolai in a dry goods business on Water Street between Columbus Avenue and Jackson Street. By 1876, Isaac and his son had their own store on Columbus Avenue. 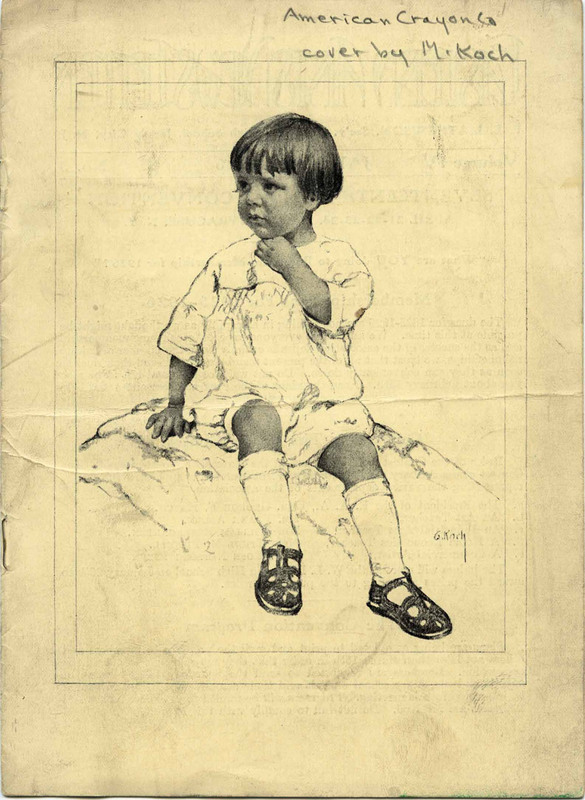 They sold china, glass and queensware, which was a cream-colored earthenware. 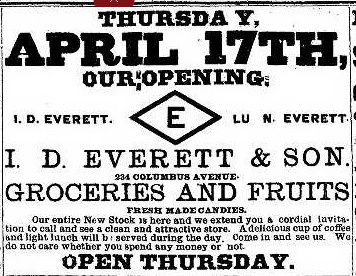 An advertisement which appeared in the April 16, 1890 issue of the Sandusky Register announced the opening of a new store, run by Isaac D. Everett and his son Lu. 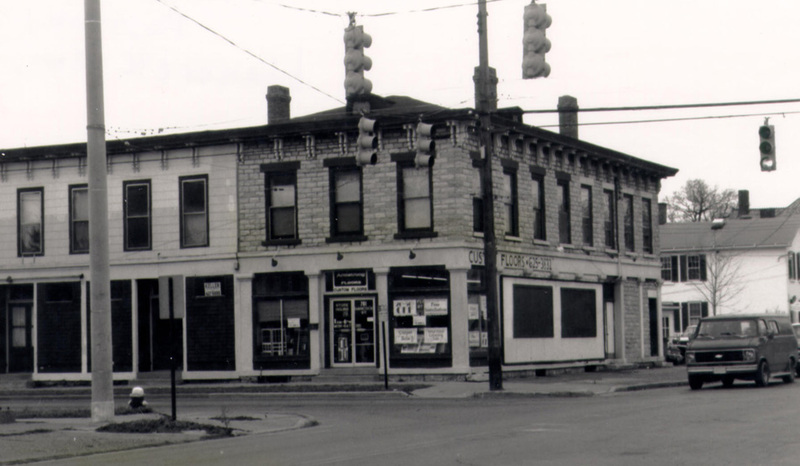 The store sold groceries, fruits, and candies, and was located at 234 Columbus Avenue. 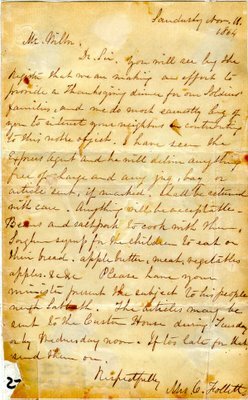 The second letter is from Eliza Follett, the wife of Oran Follett, requesting contributions from local residents to provide Thanksgiving food to the wives and children of soldiers serving in the Civil War. 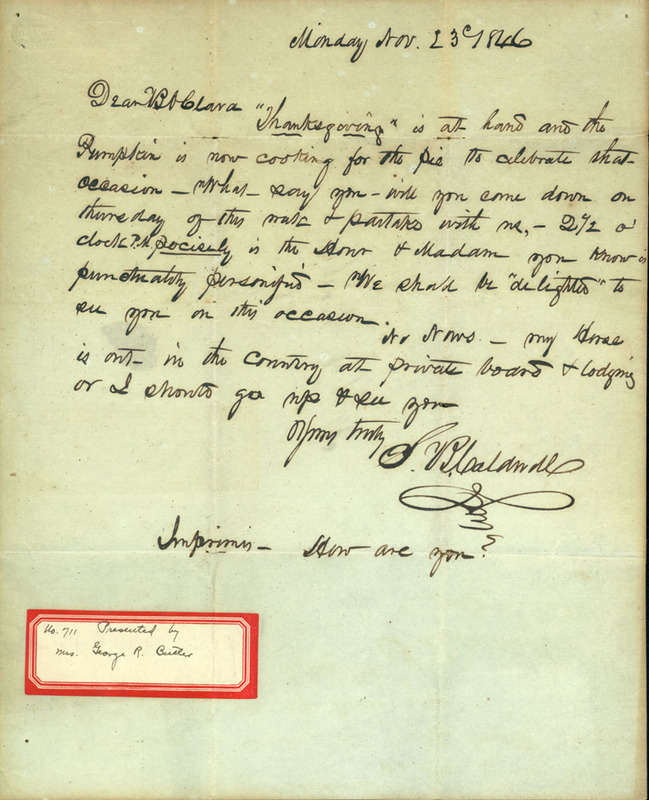 Mrs. Follett was very active in community service and charitable work, as can be inferred from this letter. Have a happy Thanksgiving. 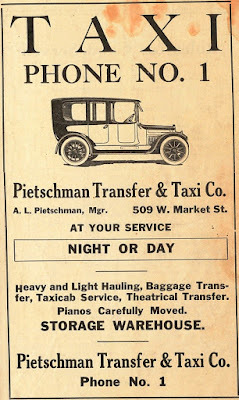 . .
Arthur L. Pietschman ran the Pietschman Transfer & Taxi Company in Sandusky in 1919. He offered taxi service during the night or day, and also moved baggage, theatrical items and pianos. 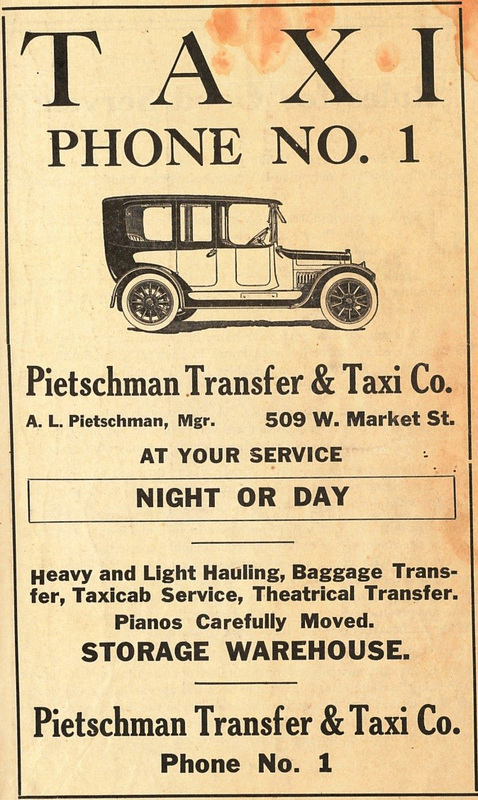 In 1923 he changed the name of his business to Pietschman’s Yellow Cab. 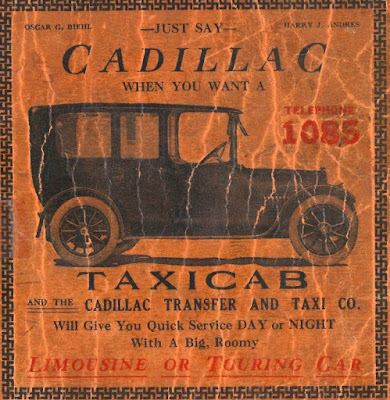 The Cadillac Transfer and Taxi Company was operated by Oscar G. Biehl and Harry J. Andres. The Cadillac Transfer and Taxi Company offered rides day or night, with a “big, roomy limousine or touring car.” The advertisement below indicates that the Cadillac Taxi provided speed with safety, and the owners suggested customers call for an appointment for the best service. E.H. Schlessman, best remembered as a commercial photographer in Sandusky for several years, ran the Buick Taxi Company. This advertisement from the December 31, 1919 issue of the Sandusky Register, states that the Buick Taxi Company offered “high class” cars that were clean and equipped with heaters. 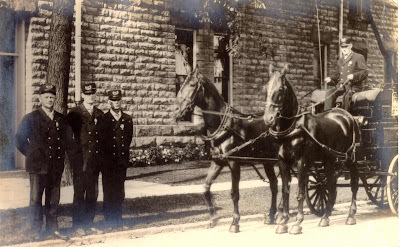 In the late nineteenth and early twentieth centuries, a fire station stood at the northeast corner of Central Avenue and Osborne Streets. Known as Fire Station Number 4, it was constructed of limestone, with a tower and an arched doorway that allowed room for the entry of horse drawn vehicles. Below is a portion of the 1905 Sanborn map which shows the layout of the fire station. This close up view shows several fire fighters at the Number 4 station. 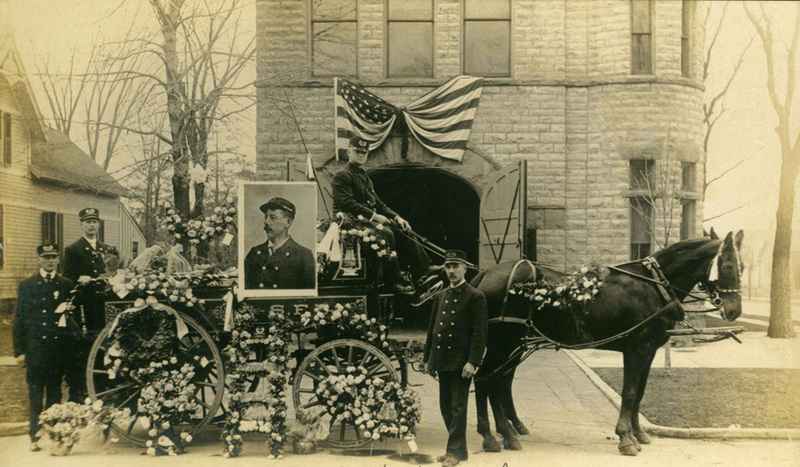 In 1908, Captain Adam E. Hartung died after he was thrown from a horse cart, while on a fire call. 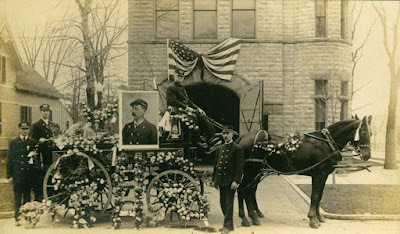 The station and fire vehicle were decorated in memory of Captain Hartung prior to the funeral procession. The former fire station at the corner of Central Avenue and Osborne Streets was razed about 1930.